From Friday 1 March 2019 until Friday 31 May 2019: Enjoy 35 % off! From Tuesday 26 February 2019 until Friday 31 May 2019: Enjoy 35 % off! From Saturday 1 June 2019 until Saturday 31 August 2019: Enjoy 38 % off! From Tuesday 5 March 2019 until Friday 31 May 2019: Enjoy 35 % off! From Tuesday 12 March 2019 until Saturday 31 August 2019: Enjoy 35 % off! From Wednesday 20 March 2019 until Friday 31 May 2019: Enjoy 35 % off! From Monday 25 March 2019 until Saturday 21 December 2019: Enjoy 20 % off! From Monday 25 March 2019 until Saturday 21 December 2019: Enjoy 25 % off! From Tuesday 2 April 2019 until Friday 31 May 2019: Enjoy 35 % off! From Tuesday 16 April 2019 until Friday 31 May 2019: Enjoy 35 % off! This comfortable ground floor suite of the first courtyard is located opposite a fountain and next to the general living room. 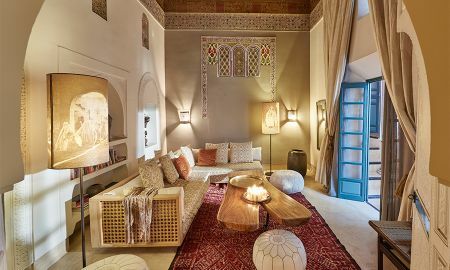 An eclectic combination of contemporary furnishings and Moroccan style, Ryad Dyor is a traditional property situated around an open-air courtyard, with decorated windows facing the patio. 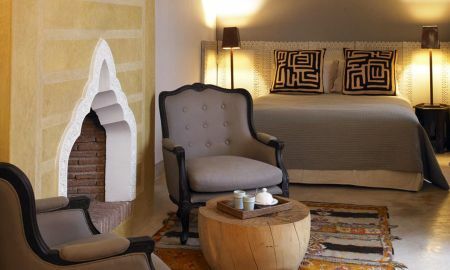 Dating back over 300 years, Ryad Dyor is now awash with modern greys and browns, original mosaic tiling and other details. 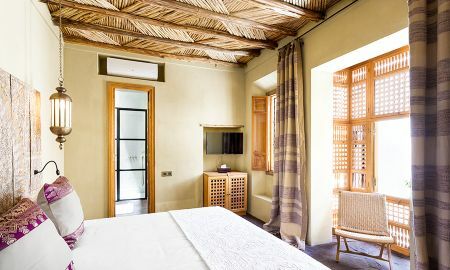 Beyond its aesthetic appeal, the Ryad provides the perfect balance of service and comfort in its comfortable rooms with cocooning traditional furniture with a touch of modernity. Overlooking the medina with its numerous mosques and snow capped Atlas Mountains in the distance, the rooftop terrace is a splendid place where you can enjoy traditional Moroccan cuisine. 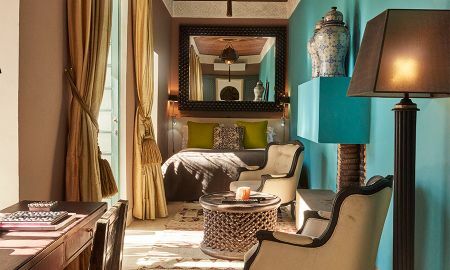 For that truly Moroccan touch, you can’t go past the Hammam, a traditional steam room covered with heated marble benches and walls, a shower room, a small space for massage and a two-person hot tub; the plunge pool in the courtyard and some chaise longues where a mint tea will be served to make your session complete. 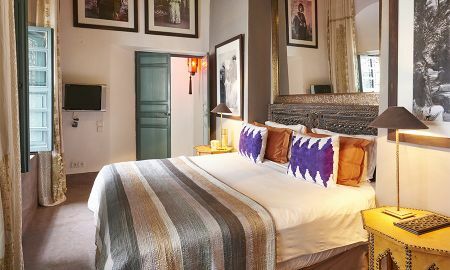 Ryad Dyor is located in the Medina, at Sidi Ben Sliman, one of the most authentic and traditional areas of the ancient Medina. 20 minutes drive from the airport, 10 minutes drive from the two golf courses, Amelkis and Royal Golf, a few minutes walk from Jamaa el Fna Square and the Souks.